Earlier this year I made a goal, a New Year’s resolution of sorts, to work more from my stash. 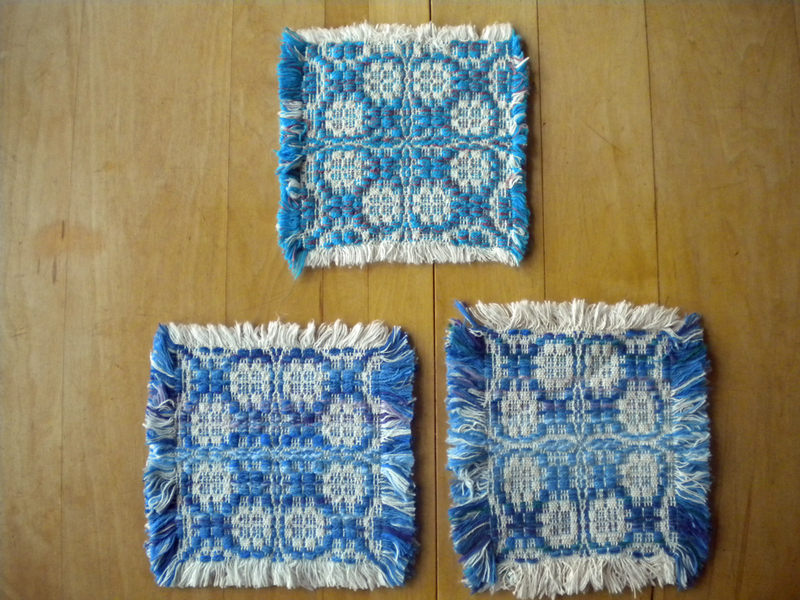 I’ve made some towels with a rick-rack cotton yarn, followed by some placemats in a heavy cotton woven in block weave. There is still my thrum basket. For ideas, I pulled up my Handwoven Magazine indexes and looked up “thrums”. (Yes, I do keep my back issues—they inspire and entertain, even if they are 20 or 25 years old!) 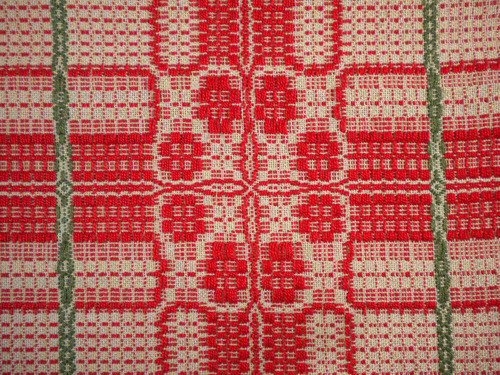 In the September/October, 1991 issue, Margaret Gaynes presented an overshot potholder design. 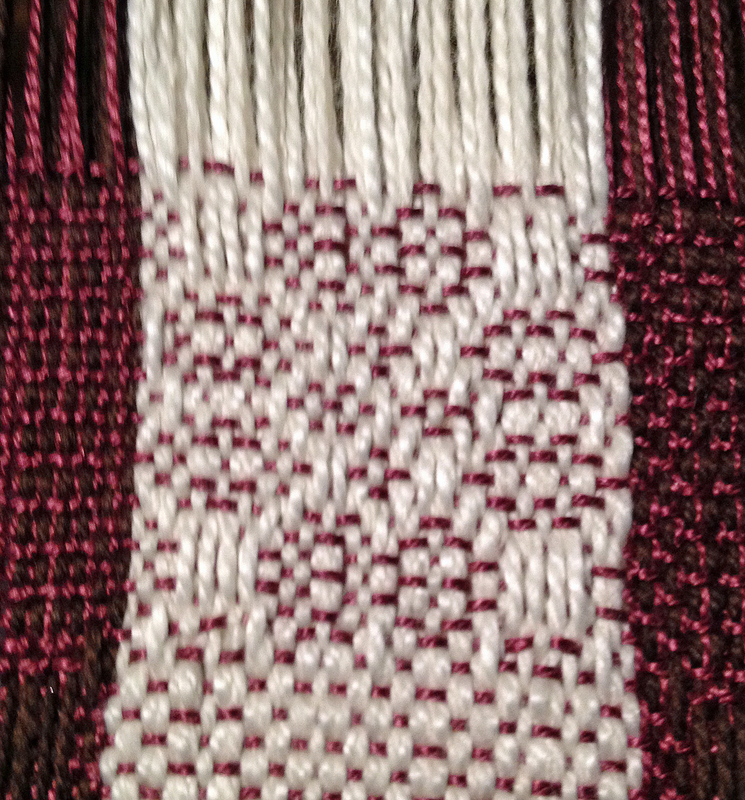 She used her thrums as the pattern weft and bordered the potholder with bias tape to cover the cut ends on each side. There was the beginning for my project. Instead of potholder, I chose to make mug rugs– those fabric coasters for your coffee mugs and water bottles. 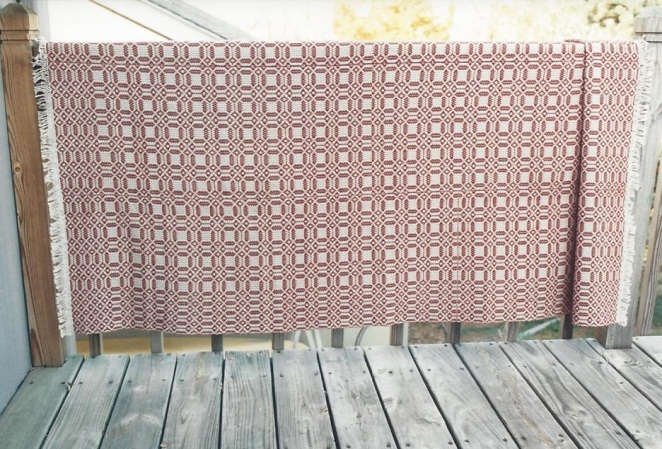 I like the idea of using an overshot design and chose a pattern with one large motif for each piece. Mug rugs are often fringed on the cut ends, but I needed to do something with the sides where my short thrums will hang off. The answer here is to apply a side fringe as well. This is accomplished by threading a dummy warp for the width of that side fringe. 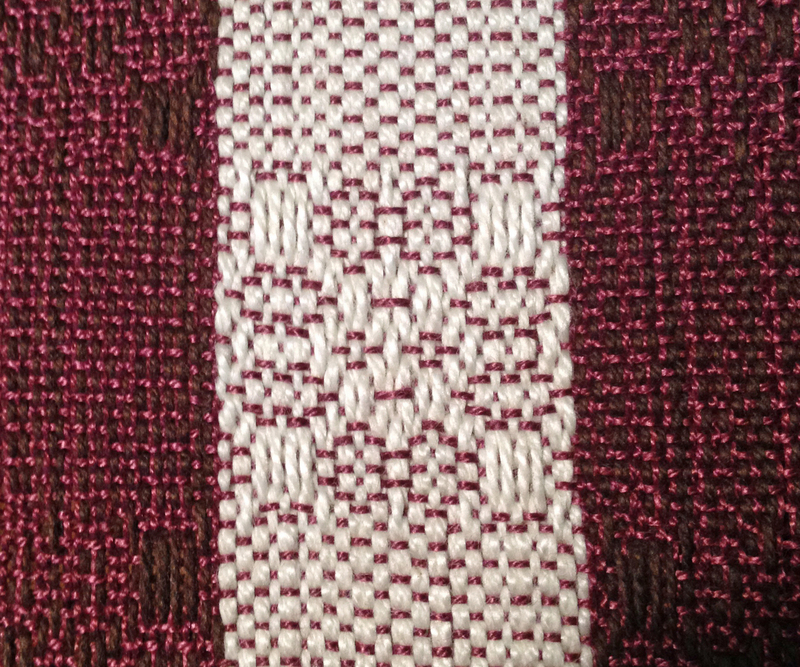 Then when the project is off the loom and machine-stitched around each mug rug, that warp is removed and the fringe remains. Of course, I’m back to wasting yarn. I’m still sampling to get the perfect size. The first mug rug had fringes that were too short (top). 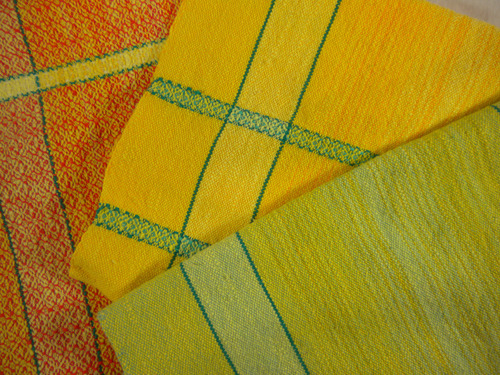 The second one, on the left, seemed too big to me (6-1/2” square with fringe). The third one, on the right, is sett closer, so it is 6-1/2” x 7” with fringe; still too big. 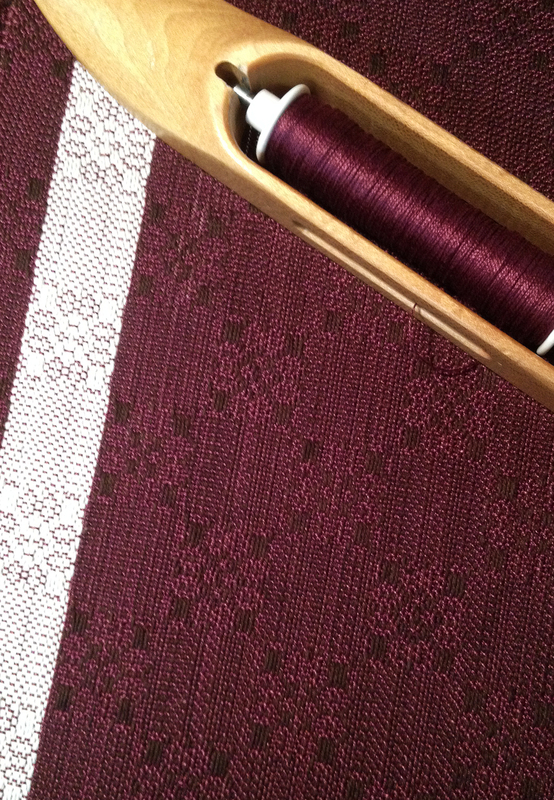 Next I will use a finer ground weft to see if I can get down to a 5-1/2” square mug rug. I’m getting there. Do you have ideas for using thrums? Let me know!